In all of creation, only one Earth has successfully met and triumphed over each Incursion that has threatened it: the Earth of the heroes of the Great Society! Guess which Earth is on a collision course with ours? Art– Valerio Schiti’s art fits the tone of the book and the overall presentation is good. Ramifications- This issue Black Bolt gets healed after the events of INFINITY which had him triggering a terrigen bomb which created a global inhuman multitude. This will no doubt lead to future developments in the Inhuman book currently published by marvel. Black Panther-Oh Jonothan Hickman, how much do I love thee? Let me count the ways! 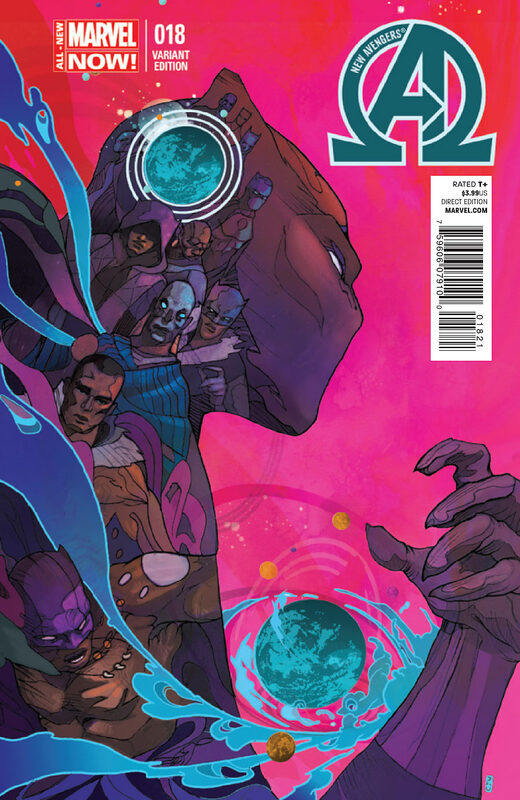 This issue we got a really cool….monologue between T’challa the deadliest man alive and the spirits of Black Panthers long dead who now reside in him. 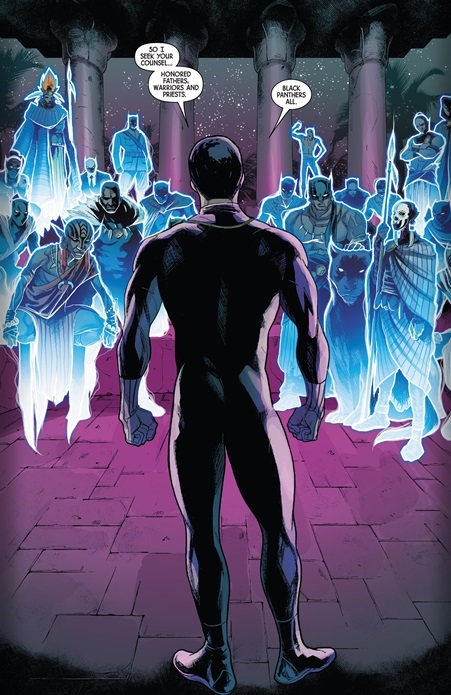 For those who missed it back in Fantastic Four #608 T’challa was made the king of the dead and was given all the strength and knowledge of the Panthers before him. What that boils down to is what we see as a conversation between T’challa and the ancestors is T’challa in an empty room conversing with himself; trippy for those who could/would walk into the room and catch him. We are treated to a cool illustration for the Valerio Schiti to flex his artistic skills by rendering a veritable menagerie of Panthers long dead. Since the series began and way back in Fantastic Four #608 I was curious how the process would work. Was it a symbiotic thing or would he just have access to their knowledge in times of need, or always? Hickman gives us a brief hint here and while its not terribly intriguing I enjoyed it nonetheless. Elephant in the room– Again Hickman teases an endgame for the T’challa vs. Namor vendetta. For those not aware let me recap. Namor has betrayed T’challa twice in the last ten years; Once when he was almost killed by Doom (See Black Panther #1 and Black Panther #2 for details) and during Avengers Vs X-men #8 and Avengers Vs. X-men #9 when he all but destroyed central Wakanda. To rub even more salt in the wound the two were once close friends, T’challa’s grandfather or was it father were also friends with the king of Atlantis. Lets also make mention of how Namor tricked Thanos’ forces to attack Wakanda in cruel revenge when his war with them destroyed Atlantis in New Avengers (2013) #9. I’m foaming at the mouth to have T’challa take Namor off the chess board for awhile whether by death or otherwise. This mother****** has to pay! Hickman ensures we dot forget this history by having T’challa’s father T’chaka the great voice this thought. Very powerful and emotive moment. Moral ambiguity– So this issue continues the ambiguous nature of our “heroes” exploits. Heroes don’t kill, do they? Wolverine kills every other week and he’s a hero. Magneto has killed and is a hero by some. Yet still Cyclops is a savoir of the mutant race and he killed Charles Xavier. All these pale in comparison however to this….do killing whole planets still make you a hero when you’ve effectively killed more people than Hitler because of your beliefs? New additions– With no end to the incursions discovered yet Bruce Banner and Hulk join the fray. How the hell is this good thing when he’s so damn unpredictable? Methinks this will not end well. Buck up-While it maybe or should be fascinating to watch our heroes struggle with the decision to destroy another world it’s inevitable and not as exciting as it once was. It’s a moot point right now and all the members especially T’challa and Namor who are or were ruling monarchs they should be used to making decisions where people are killed. Every other member is also aware they have to destroy whole planets. The hesitations while a nice way to differentiate them from villains who are unflinching in these kinds of acts it does start to grate on the nerves. They already know what they’re in for this should be like falling off a bike. Just kill these guys and their world or our world dies. It’s black and white at this point with no room for any shade of grey. 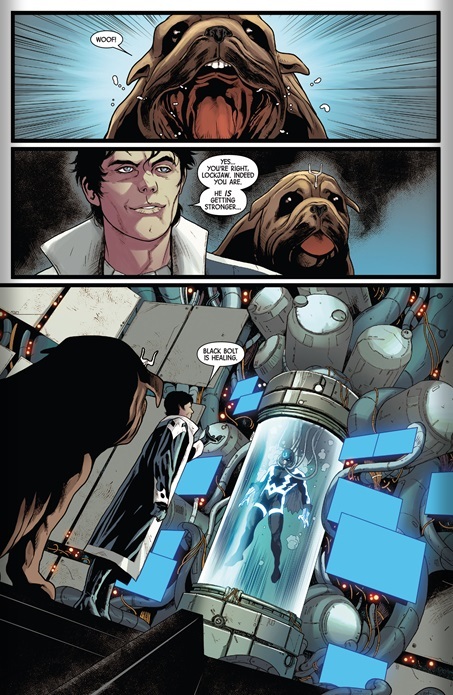 Action– Hickman has a tendency to present the dilemma and then jump to the aftermath bypassing the action completely. It’s unfortunate this may be repeated once more. Hulk was included to be on equal footing with Sun God. Tony Stark is starting to lose it. But what I am wondering if Black Swan is the culprit. I think even Strange will not destroy the world, but move it to a different time like the norn has been doing. The only members capable of destroying a planet full of people are either Namor, Strange, or Black Bolt. Hopefully issue 19 delivers. I also note that the Past Black Panthers explain all this to T’challa in a rather condescending manner like he is a dull witted pre school er . I really do hope that in the upcoming issue the character will do what is right , not what is expedient or convenient. There are worse things than dieing.